The reconstruction of water level fluctuations of Lake Duparquet using dendrochronological analyses has shown that the number of scars caused by flood ice during spring thaws has increased since the end of the Little Ice Age, around 1850 (fig. 1a). This increase is especially marked in the 20th century and most notably since the 1930s. Parallel to the increase in the number of ice scars, water levels during spring thaws have also undergone a progression (fig. 1b). Since ca. 1915, for example, the spring water level is generaly about a metre higher than at the end of the Little Ice Age. Climate studies have shown that the faster the autumn freeze-up and the greater the winter and spring precipitation, the higher the water level and the greater the ice activity during spring thaw. 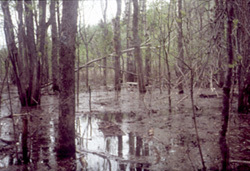 The observed rise in spring thaw water levels also influences the dynamics of forest stands situated on flood plains. The study of black ash stands revealed that, in sites most exposed to high flood waters, individuals are maintained primarily by vegetative reproduction (stump sprouts) whereas sexual regeneration is much more prevalent in sites where flood conditions are less severe. Vegetative regeneration is an important mechanism with which black ash manages to maintain itself on the lake (fig. 1d). 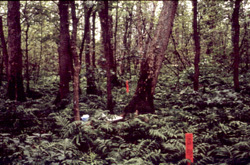 Black ash populations on Lake Duparquet are stable, with individuals in all age classes. Contrary to the virtual disappearance of black ash on Lake Abitibi following construction of a hydroelectric dam at Iroquois Falls around 1915-1920, the rise in the water level in Lake Duparquet has been gradual, thus permitting populations to shift their locations. This phenomenon clearly indicates the exceptional character of Lake Duparquet which, in the absence of man-made controls on its water levels, has managed to preserve the natural character of its shoreline. Contrary to what we might think, it appears that the increase in spring thaw water levels in Lake Duparquet has not had a negative effect on the growth of black ash. Rather, growth conditions seem to have improved since the beginning of this century, despite an increase in the number and height of ice scars (fig. 1c). Dendroclimatological studies have shown that only high flood waters that persist into the beginning of the growing season (June) have a negative effect on radial growth of the species. For black ash, early flooding may have a positive effect on growth by prolonging the growing season, especially if precipitation in June is heavy (Tardif et Bergeron, 1992 ; Tardif et Bergeron, 1993 and Tardif et al., 1994). Fig. 1. a) Number of ice scars in five-year classes (n=616) and accumulated curves of scar frequency (n=616) and age of scar-bearing trees (n=81). b) Evolution of maximum height (n=122) attained by scars since the end of the 17th century. c) Black ash growth index curve for all Lake Duparquet sites with no. of trees (153 max.). d) Age structure of black ash in Lake Duparquet (6 stands) in 10-year age classes and according to origin (sexual or vegetative).